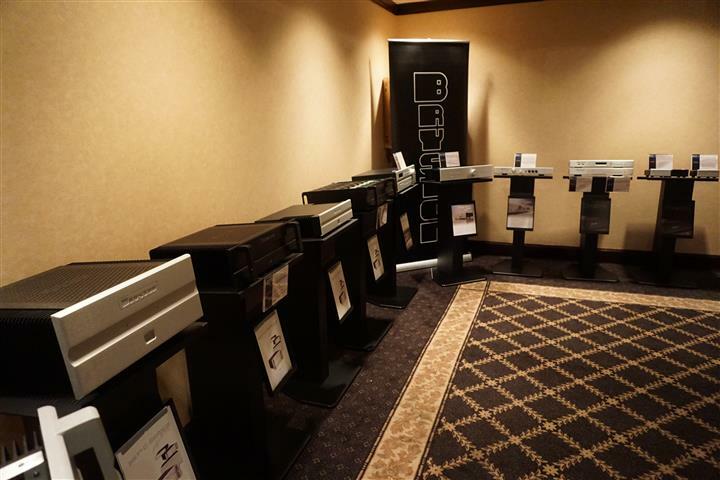 The boys from Bryston (James Tanner and Brian Russell) managed to pull off yet another glorious display of their products. 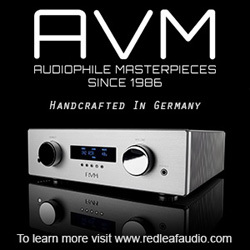 The featured system produced a very appealing sound, smooth and full with larger than life vocals. 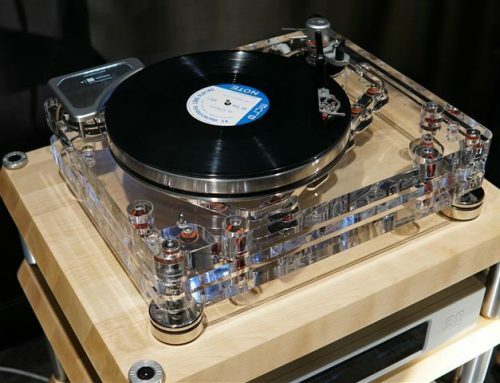 It was made up of the Model T (passive) towers ($6,495/pair), powered by a pair of 7B-SST2 amplifiers ($5,000/each), controlled by the BP-26 preamplifier and MPS-2 power supply ($4,000) and using none-other-than Bryston’s BDP-2 digital player ($2,995) mated to their new BDA-3 DSD 32-bit/384 kHz capable DAC ($3,495). 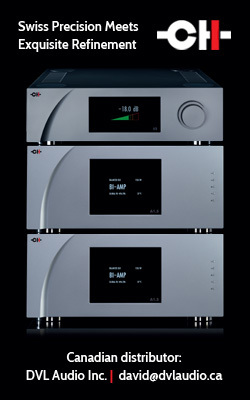 A BIT-20 ($3,000) served to make sure power was stable and clean. 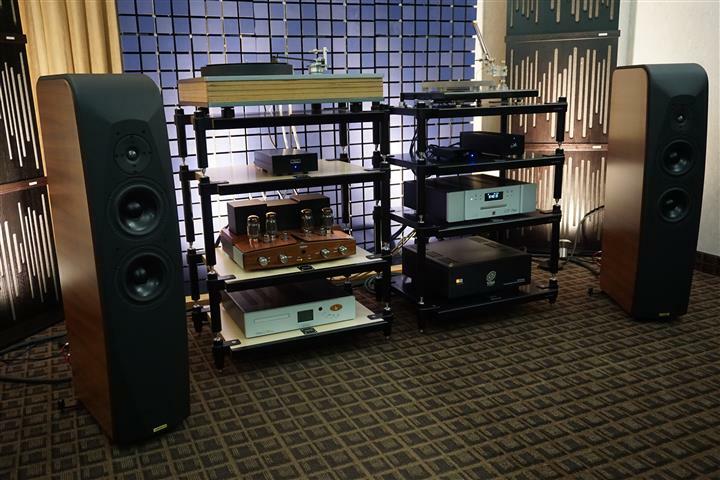 In addition to the products on demonstration, there were also a ton of audio components and speakers on static display inside this room. 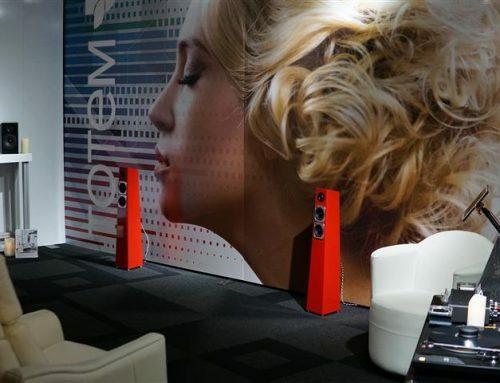 There were Bryston’s in-wall TIW and on-wall TOW loudspeakers ($560/each) and the Target HiFi speaker stands that Bryston recently took over production and distribution for – including the MR-stands (from $549/pair); HR (from $339/pair); HS (from $279/pair) and FS (from $269/pair). 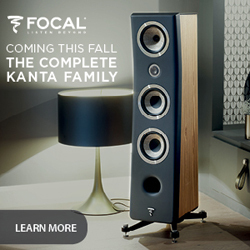 The picture below shows the Model A1 ($3,680); A2 ($2,940) and A3 ($2,525) speakers and Model A Sub subwoofer ($1,995). 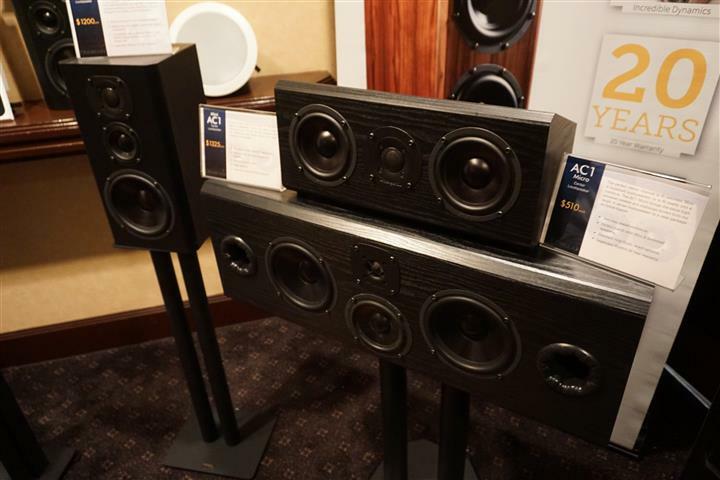 Also on display were the Mini AC1 ($1,325); AC1 Micro Centre ($510) and Mini A bookshelf ($1,200) speakers. 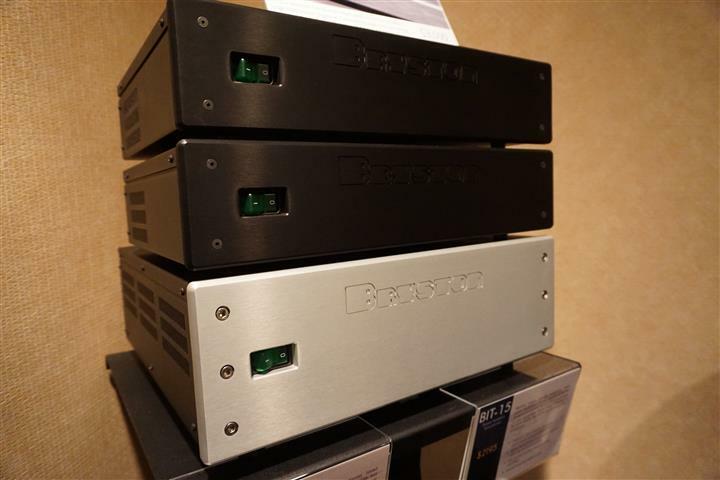 Bryston also proudly showed off a new faceplate design for the BIT and AVR power products. 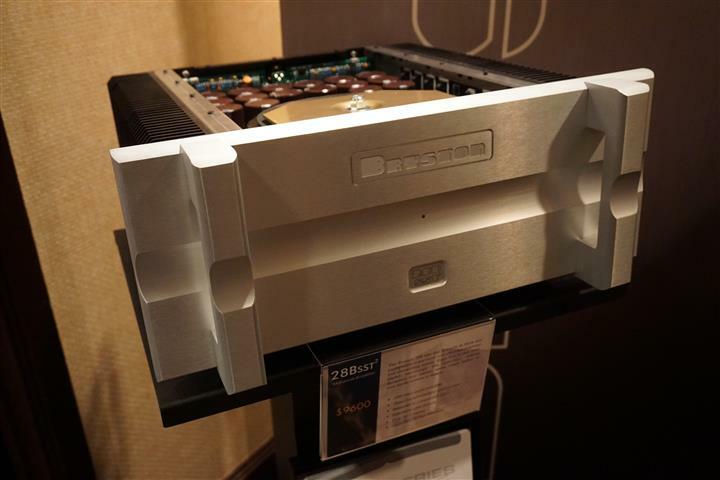 I was told that the new design brings in the traditional Bryston thin-line logo and serves to simplify the assembly process. 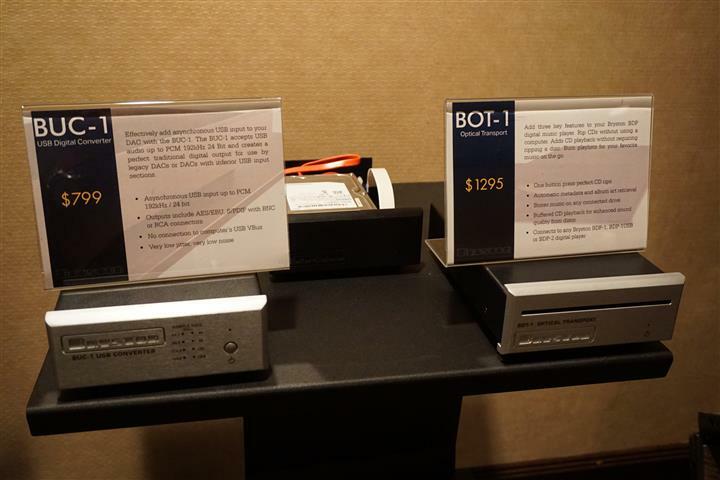 Here are the new faces of the BIT5 ($1,895); BIT15 ($2,195) and the BIT20 ($3,000) – the AVR models, which include active power stabilization and overload protection look the same but are $500-$600 more. 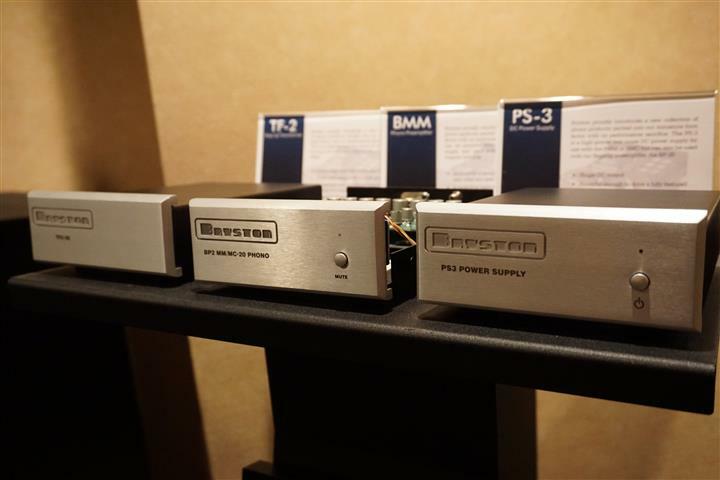 Bryston was also displaying their new compact phono stage products that are expected to begin shipping in Q1-2016. 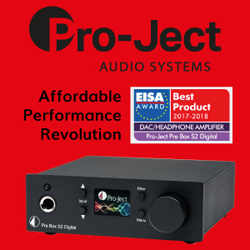 These products include a prototype TF2 step-up ($1,300) a BP MM/MC phono preamp ($1,700); BP MM phono preamp ($1,000) and; a PS-3 power supply ($800). 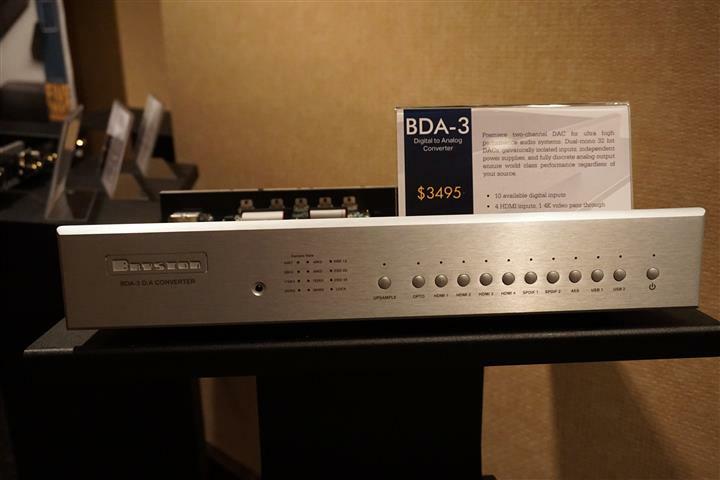 And a few shots of some of the other products that Bryston was showing off in their room. 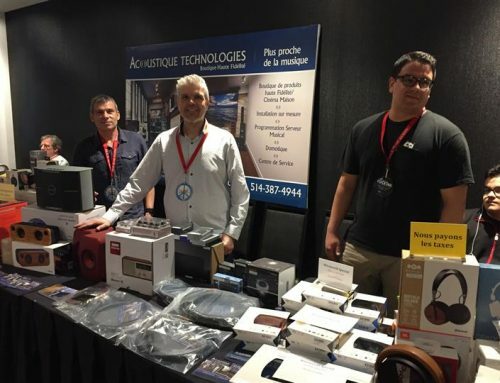 Local retailer Update TV & Stereo had a massive presence at TAVES this year and hosted three rooms, perhaps to match its number of retail stores just north of Toronto – its stores are located in Richmond Hill, Vaughan and Unionville. 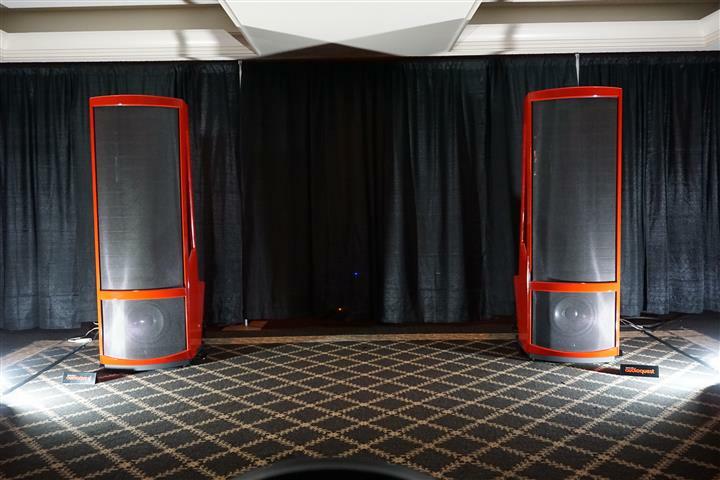 The first of the large rooms featured the new flagship MartinLogan electrostatic loudspeaker – the Neolith ($100,000/pair) in a vibrant “Rosso Fuoco” high-gloss red finish. 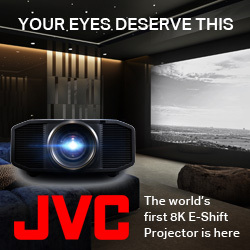 The speaker was ogled by show visitors like a Ferrari at a car show. Standing 6 ¼‘ in height, they dominated the large area, commanding the attention of all those who entered. 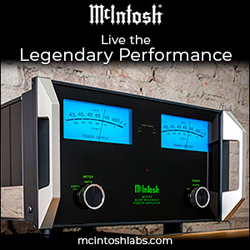 Though the system playing the Neolith was behind a black curtain – perhaps to focus attention on the speakers, I was told that it consisted of an Acoustic Art Amp II and Tube Preamp II ($12,600) with an MBL CDP C31 ($12,000) and a laptop streaming digital files. 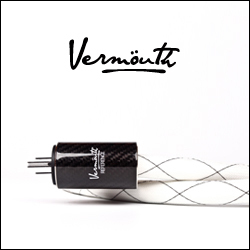 The cabling in the system was all AudioQuest, including Oak speaker cables, Earth 1m IC’s; Energy power cables; Diamond network cable, a Jitterbug and Torus Power RM20. 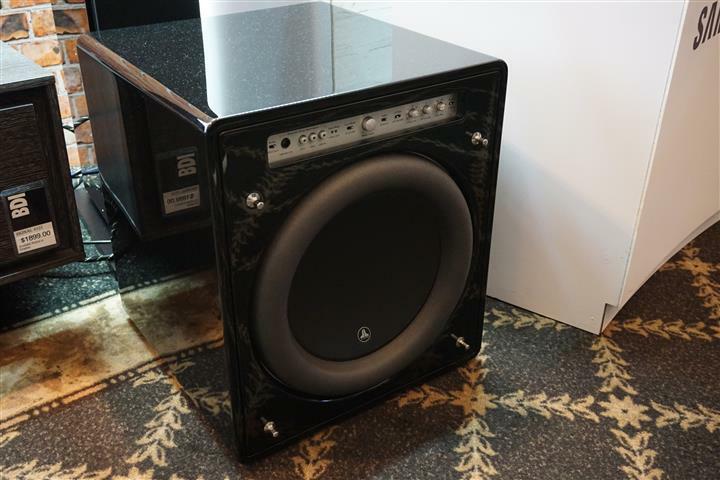 The Neolith uses a proprietary curvilinear electrostatic transducer blended with a 15-inch rear-firing ported woofer and 12-inch front-firing sealed mid-bass woofer. 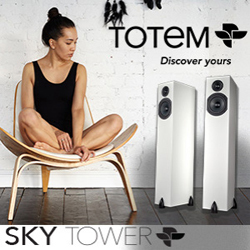 Though the sound was powerful and authoritative, I did not get a good sense of imaging and would chalk that up to the close proximity of the speakers to the ceiling in the room. 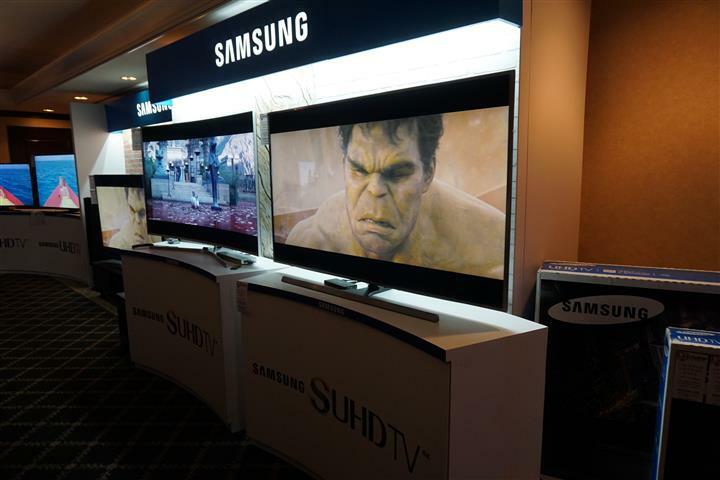 In the adjoining large room, Update TV & Stereo retailed a huge array of Samsung televisions and audio products at very special show prices. Cleverly playing into the Halloween theme (since the holiday landed on the weekend of the show), they called it the “Orange Friday”, offering ‘Spook-tacular’ show prices. 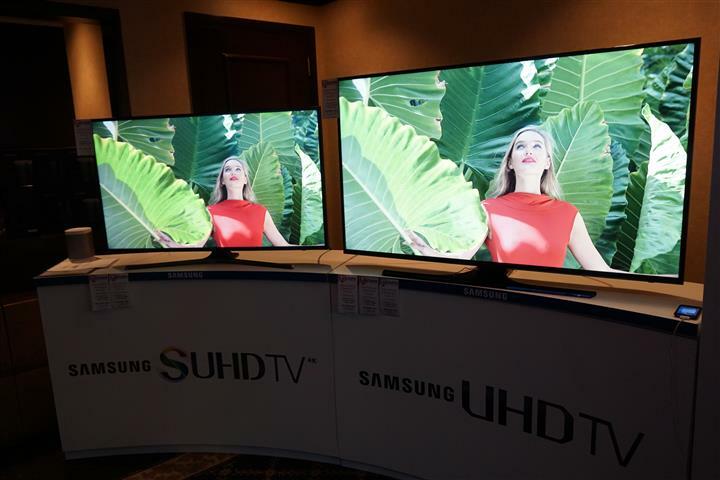 Samsung TVs on sale included the UN55J6300 1080p LED ($1,300 list / $999 sale); UN65JS8500 UHD LED ($4000 list / $3,000 sale); a UN78JU7500 UHD LED ($7700 list / $7000 sale) and; the UN65JS9500 UHD LED ($6000 list / $5000 sale), which is upgradeable through a separate Evolutionary Box ($399). 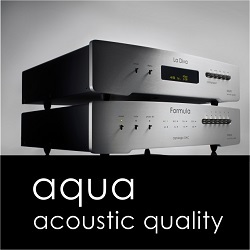 Also in the room was the new JL Audio Fathom F113 V2 subwoofer. 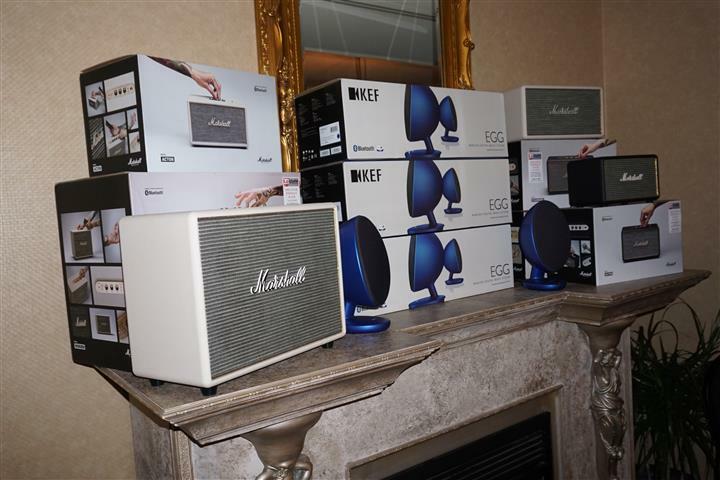 And, there were a number of Marshall mobile / lifestyle speaker products: Woburn BT speaker ($750); Stanmore BT speaker ($500) and; the Acton Bt speaker ($325). 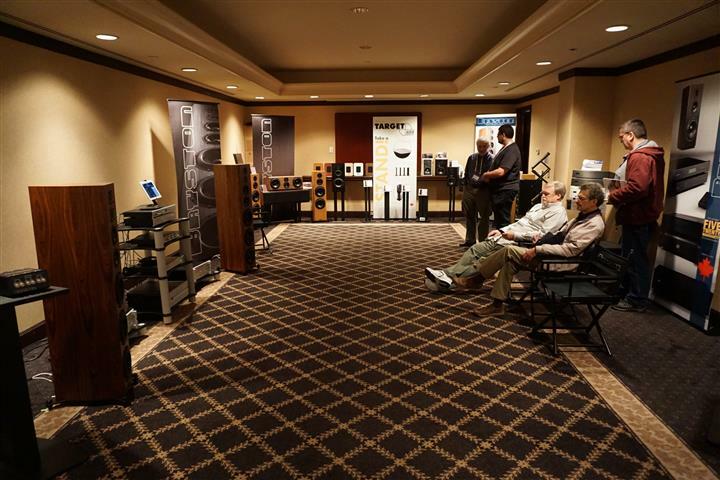 In the smaller room elsewhere at the show, Update TV & Stereo partnered with distributors Tri-Cell and Charisma Audio , to demonstrate a couple of other systems. 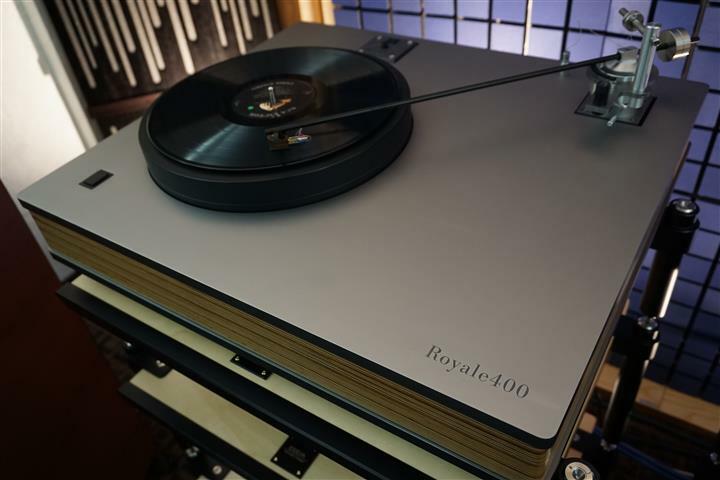 While I visited this room, I heard a system that was made up of a Well Tempered Lab Royale 400 turntable ($14,990) with the Chrisma Audio Reference Two MC cartridge ($3,500) fed into a Charisma Musiko phono stage ($1,950). 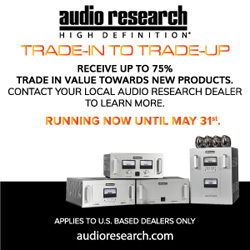 Amplification was provided by a Unison Research Sinfonia Anniversary Integrated ($7,050), which played through Opera Seconda tower loudspeakers ($4,400/pair). Listening to a 180g pressing of Harry Bellefonte’s Carnegie Hall, I was taken aback by the natural, realistic, spacious and tuneful rendition of the recording. 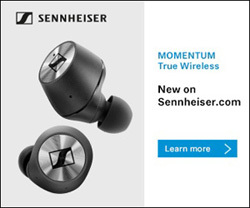 It sucked me in and put me in the audience for the moment – just lovely. 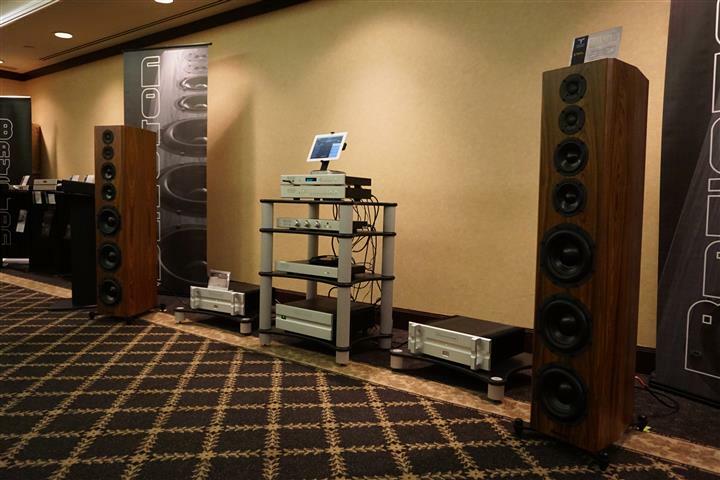 Associated equipment in this setup was a Codia Acoustic Design Stage 3000 Birch BAB Plus audio rack ($4,900 U.S.), Torus RM20 power conditioner ($3,300) and Vicoustic treatments. 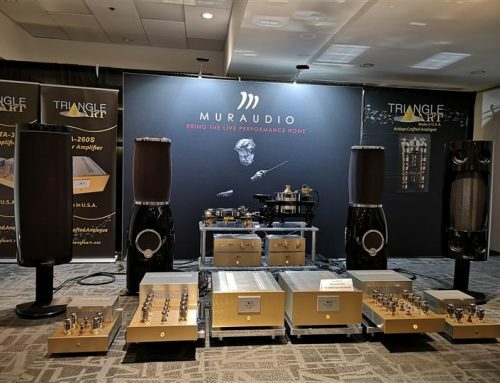 Also in this room was a Pre-Audio BT-1301G turntable ($2,800) with a Charisma Audio 103 MC cartridge ($975), Audio Exklusiv P0.2 phono stage ($1,375) with PS0.2 power supply ($1,055); Audio Exklusiv E12 integrated amplifier ($3,930) and a number of other components. 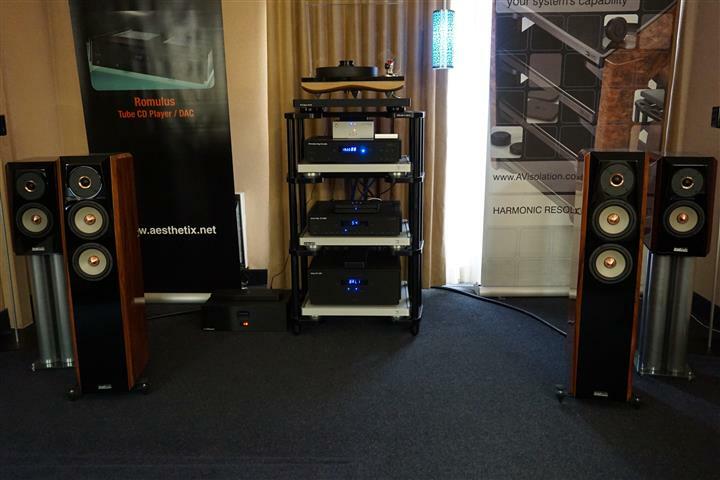 Local retailer Fairview HiFi had partnered with distributor Tri-Cell in a room to showcase Gold Note components with Joseph Audio loudspeakers. 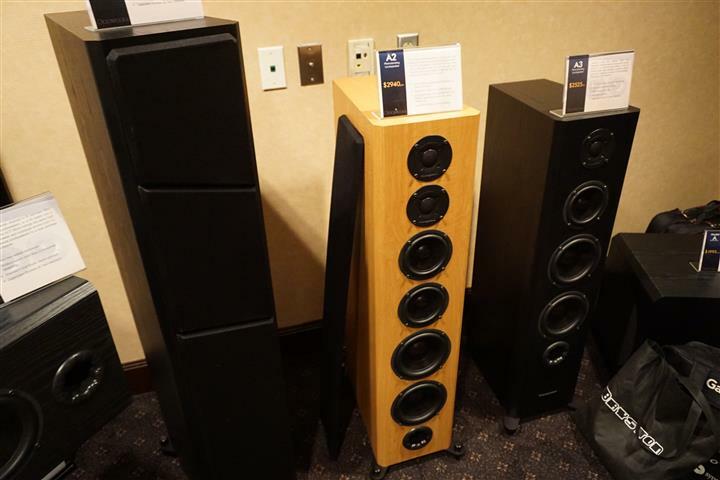 While I sat inside the room, Joseph Audio Perspectives speakers ($17,000) were in play, while the Pulsar’s ($9,000) sat on standby. 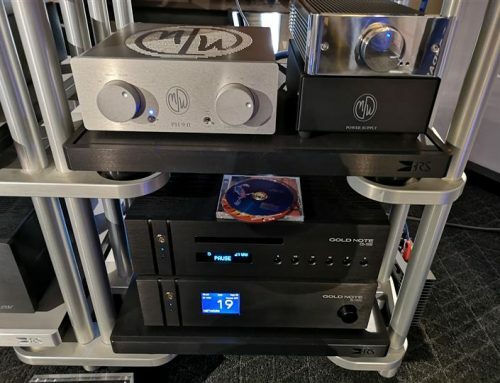 The system was made up of the Gold Note Romulus Signature CDP ($12,830), Janus Signature preamplifier ($13,985) and Atlas power amplifier ($11,225), racked on an SRS SXR-1921-4 ($6700) with Si Bases ($2,235/each). 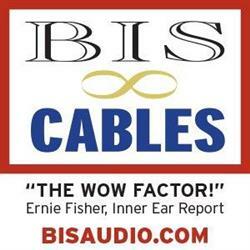 Cables in this system were Cardas Clear Reflection speaker cables ($3,200/6-feet pair), Cardas Clear 1M XLR IC ($1,300/pair) and 1M RCA IC ($1,100/pair). 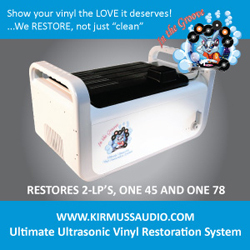 Music files were delivered by a Bluesound Note 2 Streamer ($599) from a PC and controlled by an iPad mini. 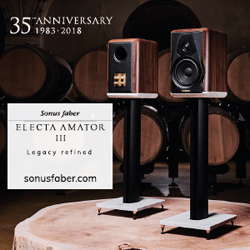 The impression I got was that of liquidity, with a fleshy tonally rich and relaxed presentation that possessed full bass accompanied with some bloom. 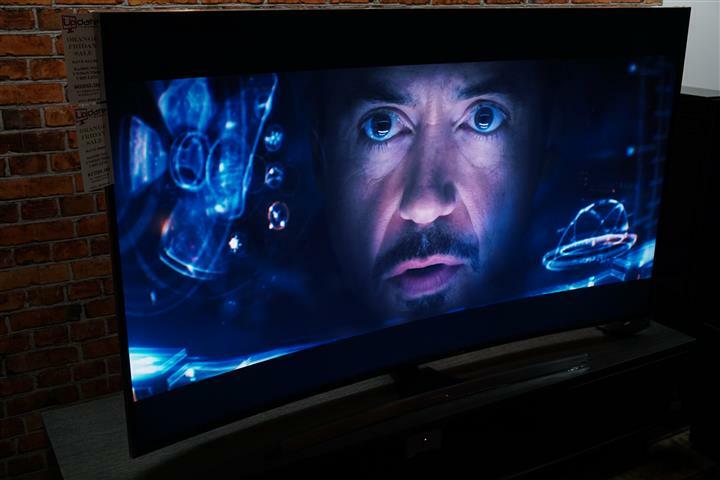 Sibilance was very well checked with an absence of hard edges but also some sense of slower speed through transients. 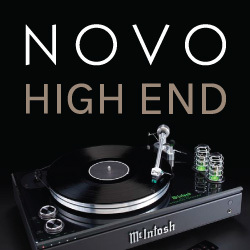 Please click here to read Part 2 of this show report.